If you only go to one museum in Las Vegas, it should be the Neon Museum. The Neon Museum is rich in what made Las Vegas famous – neon. That spectacular glow of gases swirling inside glass made the lure of Las Vegas so bright and people flocked. Sadly though, over the years, many motels, hotels, casinos, and businesses have either bit the dust or “updated” their signage. But thankfully some of that signage is laid to rest in the “Neon Boneyard”. The Neon Museum doesn’t just let these old signs sit out, they are also actively restoring their signs, slowly, one at a time. The Neon Museum offers both daytime and nighttime tours, and Patrick and I did both during our stay in Vegas, so we got to see the restored signs lit up. You’ll see a combination of both visits throughout the post. The Neon Museum is a photographer’s dream, and I took hundreds of photos! And even though I narrowed it down, it was still quite a lot! It should first be noted that the Neon Museum calls a former motel’s office home, at least for its check-in desk and gift shop. The old La Concha Motel, a marvel of mid-century architecture was designed by Paul Revere Williams, the man also responsible for LAX’s iconic Theme Building. The motel was slated to be demoed, but the Neon Museum swept in and actually moved the building in multiple pieces! Not only did the museum save the building, but the glorious mosaic inside, as well as part of the stunning neon sign that accompanied it, which was one of the restored signs. This “MO” and “T” that is out of frame is also part of the La Concha sign, however, the “EL” have been lost. 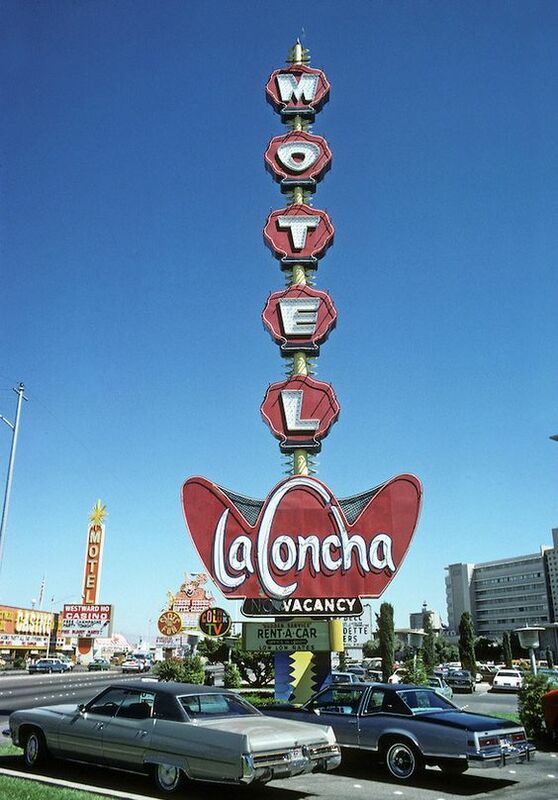 The letters spelling out “motel” stood upright atop the now restored La Concha sign. You can see how it originally looked in this vintage photograph. These “Sleez” is actually a signature, which was done by painters, often in places that wouldn’t be seen on a daily basis. I personally thought that was one of the neatest things I learned! We were informed that this spectacular Yucca Motel sign is next in light to be restored. I honestly cannot wait! As this was my favorite sign from the museum. The Stardust was a close second after the Yucca Motel, as it is just too fabulous for words! It speaks to my atomic-age loving heart in so many ways. And last but not least, I have to share that the Neon Museum has two cats! One of which I got to pet! I learned their names of Elvis and Liberace – purrfect names, huh? All tours at the Neon Museum are guided, and you learn a lot! Purchasing tickets in advance is highly recommended, as both times we went, they had a sign out saying they were sold out for the entire day. If you have the time, I recommend doing both the daytime tour and the nighttime tour, doing the nighttime one first. And if you only have time for one, do the daytime tour. Learn more and buy tickets on their website. Fringe Leather Jacket: I honestly don’t remember! 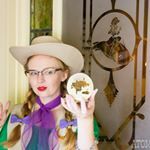 You’ll find all of my recommendations for visiting the Neon Museum in the last paragraph at the very end of the post. Since you love the southwestern one, I want to tell you about another great one. If you ever make it to Prescott, AZ, there’s an antique row just off the square. 1 store has an amazing, restored (but not for sale ) motel sign for Burro Jim’s. It’s a fully loaded miner’s burro whose tail wags. Great pics! I’d love to see the museum in person one day. When we vacationed in Austin several years ago we wandered off the street into Roadhouse Relics. The artist, a lovely and welcoming guy, does modern neon work in a vintage style. I think you’d enjoy poking around the gallery. Someone was sure thinking when they decided to save these signs and create a museum! I’m so glad they weren’t destroyed- as they are all so colourful and unique. It looks like a fun place to visit. Magnificent 😍😭. I think we’ll probably go this year !